We tend to appreciate our significant others year round because of all they do. Surprise them on Wife Appreciation Day with an extravagant gift basket! We have a large selection of gift baskets that will show your appreciation and love. Here are a couple gift baskets for women that are sure to be a success. 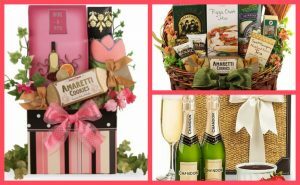 Cosmopolitan Gift– If your wife enjoys making her own mixed beverage and indulging in some sweet treats, then this basket is for her. Included is a delicious mix that she can add her favorite alcohol to for a unique cocktail. Also, there are three types of cookies to try. Deluxe Dinner Gift Basket– Does your significant other enjoy making new dishes for your family? This basket covers a couple gourmet meals and snacks. Your entire family will spend quality time enjoying this basket! Chocolate Fondue & Champagne for Two – Need an idea for your next date night? Then give this basket a try! This kit contains two mini bottles of champagne, chocolate, and all of the items necessary for fondue! All you need to provide is the items for dipping. There are plenty of ways to say thank you, so finding a basket that is perfect for your wife is easy to do thanks to BiskeBaskets.com. Choose from a large assortment of gift baskets for women or one of our other fantastic gifts. Just remember to order soon! Wife Appreciation Day is September 19th!